You've heard that famous quote, usually attributed to (HISTORICAL FIGURE)__________: "Well, Suzyn, you just can't predict baseball." Nonsense! You actually can't not predict baseball. 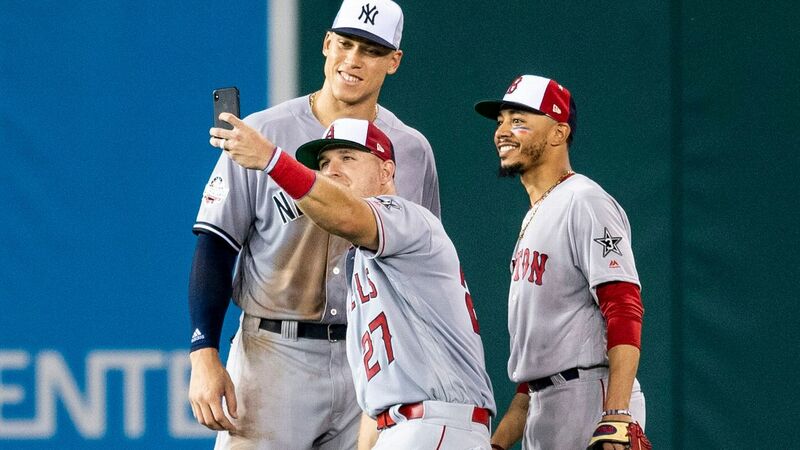 You can predict, for instance, that Mike Trout will lead the league in WAR, with a career-high (TWO-DIGIT NUMBER)__________. He's Mike Trout! He's the best. Or he'll finish second to Mookie Betts, because he's the other best. And you can predict that (TERRIBLE PLAYER)__________ will finish third. Sure, he seems terrible now, but it's baseball, and terrible players are always doing incredible things in baseball. He'll credit life-changing advice his (AUTHORITY FIGURE)__________ gave him over the winter: "If you want to (VERB)__________ the (NOUN)__________, first you must (SAME VERB)__________ yourself." Deep! Statheads will dismiss his hot start as, "Pfft, small sample size," noting that it takes (NUMBER)__________ months for a hitter's (THREE LETTERS)__________+ to stabilize. Beat writers will quote an old scout who watched him in (CITY WITH NO MLB TEAM)__________ 14 years ago and always knew he'd become a star. That's just baseball: 75 percent of what you think will happen will happen, as will 25 percent of the impossible. Against absolutely every indication, the (ASTROS, RED SOX, YANKEES OR DODGERS)__________ will miss the playoffs. The other superteams will all win at least (NUMBER OF A SICK PERSON'S TEMPERATURE)__________ games, but by baseball law one team with all stars will lose to one team with none. Why? Well, their ace will rupture his (BODY PART)__________, and their GM will overpay for a declining (BASEBALL PLAYER ARCHETYPE)__________ at the trade deadline, but that's merely the how. Why this team? Why not another? But we still believe in this dumb sport. We believe in Yasiel Puig's imagination, and we believe that putting him in Cincinnati will be like dropping Marty McFly into the 1950s. We believe this year Puig will carry a (ANIMAL SMALLER THAN YOUR FIST)__________ in his back pocket -- he'll name it (PERSON YOU'D PUT ON A POSTAGE STAMP)__________ -- and whenever he slides, we'll hold our breath, imagining crushed fur or feathers, until Puig pulls the little guy out, hale and strong, and nuzzles its head. We believe in the Rays' innovation, that they'll again push baseball strategy forward. [It'll be a little technical, a little complicated, but the basic idea is to eliminate the (BASEBALL-RELATED NOUN)__________ entirely.] It will be a huge success, as they'll finish only (SINGLE-DIGIT NUMBER)__________ games out of the playoffs. We believe in the shakiness of closers, and believe your team's will lose his job to either (PITCHER ON THE 2011 TWINS)__________ or a live-armed minor leaguer named (YOUR GRANDPA'S FIRST NAME + NINJA TURTLES CHARACTER)__________. As for the champions? Easy: (AL TEAM)__________ against (NL TEAM)__________ in the World Series. Beyond that, who can say? Historical figure: John Sterling. Two-digit number: 12. Terrible player: Chris Davis. Authority figure: Librarian. Verb: Seek. Noun: Gold. Whole number: 4. Three letters: OBP. City without an MLB team: Sonoma. Astros, Yankees, Dodgers or Red Sox: Red Sox. Number of sick person's temperature: 101. Body part: Thoracic outlet. Player Archetype: Fourth outfielder. Animal smaller than your fist: Hummingbird with an injured wing. Person you'd put on a postage stamp: Elizabeth Cotten. Baseball-related noun: Defensive position. Single-digit number: 6. Pitcher on the 2011 Twins: Liam Hendriks. Your grandpa's first name +Ninja Turtles character: SiJammerhead. AL team: Indians. NL team: Dodgers.